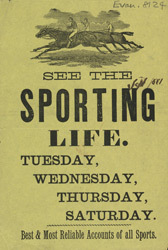 This is an advertisement for the Sporting Life periodical. Sport became very popular during the Victorian period, it came to be looked at as very British both to participate and to watch. Sport was not just good physical exercise but was bound up with moral self- improvement and discipline. Very little is known about sporting periodicals of this period however it is clear that sport mattered to people and they wanted to read about it, and not just about who won or lost, but about the personalities and histories of particular sports. Evanion has written on this advertisement Sep 1881, this is the date that he collected it.